French butter. Suitable for vegetarians. 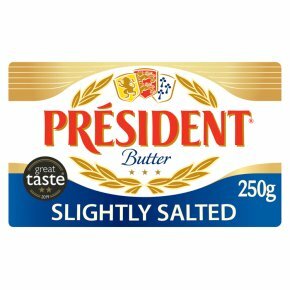 Made in the heart of Normandy with the finest milk and cream, Président Slightly Salted Butter offers all the pleasure of French butter with just the right amount of salt. Scrumptious spread on fresh bread or crumpets and perfect for savoury pastries and sauces, bringing a delightful taste to every occasion.